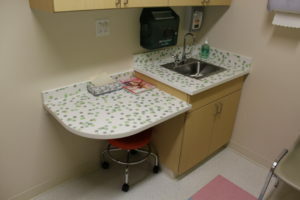 Plastic laminate is a popular choice for countertops and cabinets due to its durability, affordability, and aesthetics. Learn how to practically take care of your new plastic laminate countertops and cabinets to maintain its longevity and beauty. To clean your plastic laminate of surface dirt, you can simply use a damp cloth and mild detergent. Rinse thoroughly with warm water and wipe dry. The plastic surface resists spills, fingerprints, and most food stains. If you do find a tougher stain like coffee or tea, scrub the area using a mild household detergent and a soft bristled brush. If the stain persists, use baking soda and warm water on the brush instead of the mild detergent. Ten to twenty light strokes should remove the stain. Although baking soda is a low abrasive cleaner, it’s possible to damage the surface (especially on a gloss finish) if you use too much force, so keep the strokes light and to a minimum. If the stain persists after you’ve completed these methods, try using undiluted bleach or nail polish remover. Let it sit on the stain for no longer than two minutes. Rinse with warm water and wipe dry. If the stain shows improvement and the bleach or nail polish remover hasn’t damaged the surface, you can repeat if necessary. Just remember that prolonged exposure to bleach will discolor the laminate. We recommend Windex®, Glass Plus®, Fantasik®, Mr. Clean®, Formula 409®, and Isopropanol to clean your plastic laminate surface. We do not recommend any cleaner that contains at least one of the following chemical ingredients: hydrochloric acid, sulfuric acid, hydrofluoric acid, phosphoric acid, sodium hydroxide, and pumice. These abrasive, acidic, or alkaline-based cleaners can mar, etch, corrode, or permanently discolor the surface. In addition, don’t let bottles or rags that have these materials on them contact the surface. Drain cleaners containing lye, oven cleaners, rust removers, toilet bowl cleaners, and any cleaner that contains harsh chemicals can also permanently damage your laminate surface. If you’re not sure if a certain cleaner is appropriate, check with its manufacturer. If there’s an accidental spill from any of these materials or chemicals, wipe it off immediately, rinse several times with soapy water, and thoroughly dry the surface with a clean cloth. Never set hot pans, dishes, or any appliances that produce heat (electric skillets, heat lamp, etc.) directly on the surface of your plastic laminate countertops. Heat can permanently mar the surface and cause cracking or blistering. Always use a heat shield, hot mat, or trivet. Also be aware that dyes (hair, textile, and food) can permanently stain your plastic laminate. If a dye accidentally spills on your countertop, wipe it up immediately with household detergent. 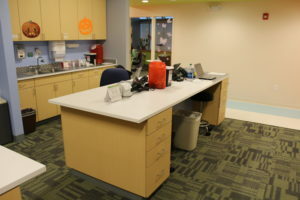 If you have any questions about cleaning and maintaining your plastic laminate countertops and cabinets, contact us and we’d be happy to offer further advice.